Hawaii entrepreneur Rob Bertholf this weekend launched HawaiiKlout.com, a directory of “Hawaii’s Most Influencial.” (Presumably, “Influencial” is a portmanteau of “influence” and “influential,” and not a typo.) 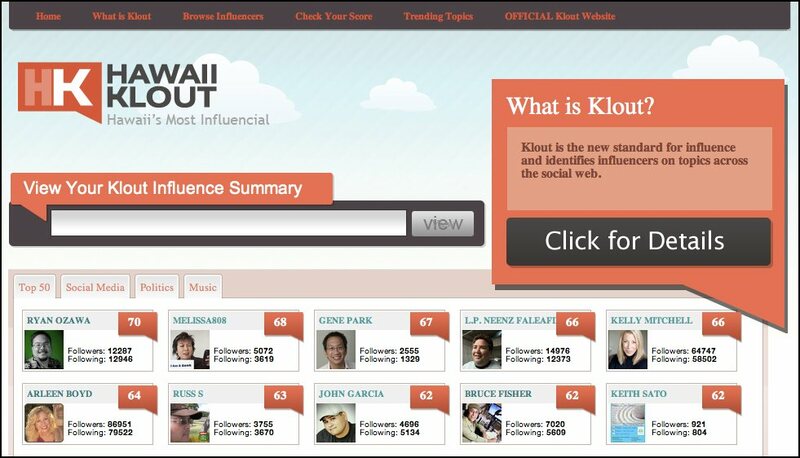 The site connects to an API provided by Klout, which purports to provide “the standard for influence” across social networking platforms. To find Twitter users in Hawaii, Bertholf explains, the site indexes Twitter posts as fast as it can (a rate limited by Twitter to 150 scans per hour) and accepts user submissions as well. After non-Hawaii users turned up in the rankings, a “flagging” system was quickly implemented to remove bad results (like Justin Bieber). 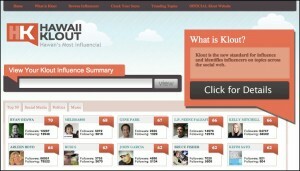 Klout is one of many services attempting to provide metrics for the fast evolving social media industry. Others include PeerIndex and Twitalyzer. Bertholf says that he is working on integrating PeerIndex data into HawaiiKlout.com, but notes that he thinks Klout may be the dominant service. Even so, Klout numbers have their quirks. Of course, using a follower count as a metric also has its weaknesses. (Klout agrees, but of course they would.) For best results, you need to look at the whole picture, which is just as true in social media as it is in the real world.